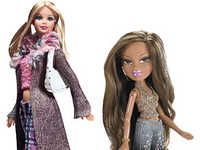 A federal jury in Riverside, Calif., determined Thursday that MGA Entertainment’s hugely popular Bratz dolls (pictured left) were designed while the designer worked for Barbie’s home, Mattel Inc. . . .
[I]t’s a big win not only for Mattel but also for Mattel’s attorneys, a team led by John Quinn of Quinn Emanuel, who called into question the credibility of the designer, Carter Bryant, after the designer used a program called “Evidence Eliminator” to wipe his computer hard-drive. The Judge declined to get involved in the dispute involving [an] exclusive access contract between one set of lawyers and a hotel that did not allow for the booking of rooms by the opposing team due to concerns that sensitive documents would get delivered to the wrong lawyers! Wow. What will people think of? !